This article first appeared in the December, 1954 issue of Motor Life magazine. CHEVROLET'S stylists, engineers and sales personnel are out to give the public exactly what they want in 1955. If the public wants an expensive-looking car, the 1955 Chevrolet resembles, more than superficially, expensive older brothers Oldsmobile, Buick, Cadillac. If it's horsepower and a new engine that's desired, the 1955 Chevy features their new short stroke V-8 which is rated at 162 hp and with an optional power package turn out 180 hp. If it's low speed acceleration, the 1955 model Powerglide now has a low with a "snap." If it's the sleek, "low" look, the 1955 Chevy models have been reduced in height; up to six inches for the station wagons. If it's the sports car look, enthusiasts will be happy with a grille which could have originated in the Italian Ferrari factory. And if it's "feel" and cornering the buyer is looking for, Chevy's new "spherical-joint" front suspension and wider-apart rear springs will offer that. If it's economy, the proven, in-line six cylinder engine is still available — but with upped horsepower which makes no slouch of the six cylinder version — in performance. Chevrolet lovers, who watched slightly abashed as their car took a second seat in national sales, once again have something to crow about and it's as big a story as Chevrolet's introduction of the six cylinder engine in 1929 and the subsequent change in concept of low-priced values. The most dramatic aspect of the 1955 Chevrolet is the new look; lowered tops, hoods, belt lines and "goodies" taken directly from some of General Motors' Motorama "dream cars." The grille, a cross-mesh affair, is wide and set into a front which slopes inward from top to bottom. Headlights are completely shrouded ala Cadillac. From the headlights back, the car is definitely GM and, judging by sales of the Oldsmobile, Cadillac and Buick, that ain't bad. The Chevy has the GM wrap-around windshield this year and it serves to only further enhance the GM relationship. Through some alchemy known only to automotive stylists, however, the car still manages to look like a Chevrolet. How the stylists have managed to change the body so drastically and still retain this look remains a great mystery to the us. 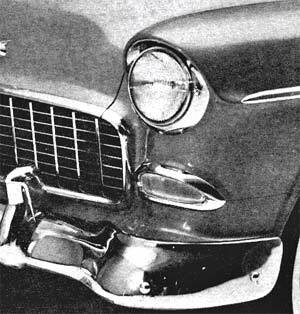 Frontal treatment of the 1955 Chevrolet features inward slope, Ferrari-type grille, hooded headlights and wrap-around bumper. Although Chevrolet will advertise two engines, there are actually four. 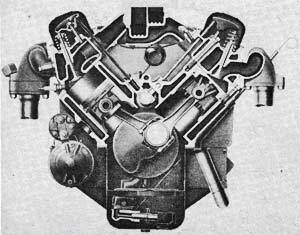 The new V-8 (called valve-in-head by Chevrolet, known as overhead valve to the remainder of the industry) packs a compression ratio of 8:1, has a displacement of 265 cubic inches, a bore of 3.75 inches and a stroke of 3 inches; undoubtedly the shortest stroked engine in the industry today. (For complete details on the V-8 engine, see Chevrolet's New V-8 Engine story in this issue.) The standard V-8 engine, as stock in the 1955 Chevrolet, will boast 162 horsepower with a single carburetor. For speed enthusiasts, an optional "power packï¿½age" is available which consists of a four-throat carburetor and dual exhausts. According to Chevrolet engineers, this raises the horsepower to 180. Trunk and rear fenders resemble style on Olds, Buick. Tail and backup lights are massive, slope inward under chrome hooding. The other "two" engines are the two models of Chevrolet's famous six cylinder model. The manual transmission model is available with 123 horsepower. Powerglide models come with 136 horsepower. Both are designed for maximum economy — but their performance will be not very far behind the field's V-8s. Not content with the new horsepower and torque ratings. Chevy engineers have also supplied the American motorist with a choice of transmissions; Powerglide, standard and overdrive. The new Powerglide has been redesigned to shift more smoothly, to accelerate more rapidly. And the engineers have been successful. In a series of test runs, MOTOR Life test staff found that the Powerglide Chevrolet models were equal to, and in the majority of cases superior to, the manual shift models for out-and-out acceleration. Although the stick-shift model digs out from a stoplight faster, the momentary lull while shifting gears (regardless of snap shifts) allows the Powerglide model to move strongly ahead. Starting in the Powerglide "Low" range and then shifting into Drive, provided a faster initial start but the difference is almost imperceptible. Powerglide, for '55, is quiet and effortless, maintaining the best of the "shift-less" transmission feel. Above 20 mph, the transmission digs in sharply and the Chevy V-8 accelerates from 20 to 60 like a well-tuned sports car. The old "American low-priced stocks won't hit 100" attitude of speed enthusiasts is closer than ever to oblivion, for the Powerglide-equipped Chevy turned in a fastest one-way run of 98 mph. With a spot of tuning and/or with the optional speed kit, the car should easily exceed the magic 100 mph mark. New 1955 Chevy Turbo-Fire V-8 features short stroke at 3 inches and bore of 3.75 inches. Displacement of the 162 hp engine is 265 cu. in. Bore and stroke, 3.75 x 3. Advertised horsepower, 162 (180 with optional power package of dual exhausts and four-throat carburetor). Chevrolet six is also available with 123 hp for manual shift, 136 hp for Powerglide models. The 1955 Chevrolet feels as good as it looks. Lower to the ground, with a vastly improved suspension, the car stays snug to the road at all speeds up to 70 mph. Over that figure, there is a little sidesway and the passenger car type of springing shows up when the car hits bumps at high speed. The new ball-joint front suspension holds the wheels tight into curves and bends, regardless of heel-over in the body. Drivers who navigate curves by the seat of their pants will find that less caution will have to be used when diving into corners and negotiating tricky mountain roads. The test car had power steering as standard equipment and the reduced amount of wheel travel gave test drivers the impression that they were handling a car which had been especially set up for the Mexican Road Race. In the rear, Chevrolet engineers have added to the stability of the passenger cars by adding nine inches to the length of rear springs, giving them a total length of 58 inches. By repositioning those springs further outboard of the chassis, the engineers have indicated that the Chevrolet Corvette made a good test study car, for it is a move directly from that model. One of the most unusual aspects of the new suspension system is Chevrolet's anti-dive factor. A control arm geometry cancels out most of the objectionable nose-spin aspects of braking. The 1955 Chevrolet rolls to a flat, level stopï¿½in controlled braking procedures. Comparison photograph shows the difference between the "tails up" attitude of the '54 and the level '55 when quickly braked at the same speed. 1955 models have ball-joing front suspension with "anti-dive" features. Note how the '55 stays level, '54 "dives" braking. One interesting model driven by the MOTOR Life test staff was the overdrive-equipped standard transmission sedan. Long desired by many Chevrolet owners, overdrive Chevrolets were rare. Owners were forced to order overdrive units from outside manufacturers, have them installed at home. Now, Chevrolet has made an overdrive unit optional equipment. This unit substitutes a high performance 4.11:1 rear axle ratio for the 3.7:1 ratio which is normal with the standard transmission. Test instruments showed that the Chevrolet engine, when in the overdrive range, was working 22 percent less and was actually turning over 600 engine revolutions less per mile at moderate cruising speeds. Frame for the Chevrolet V-8 uses a new design, stiffer side members and a better placement of engine mounts. Side members of the strengthened frame have been located over a foot further apart at the narrowest point and have been brought four inches closer together in the rear. In an interview with a frame engineer, the MOTOR Life test staff learned that the new frame had been built with engine vibration and a resistance to frame twist in mind. To reduce engine vibration, the new engine is now mounted on four, instead of last year's three, mounts. The front mounts are the strut-type and are attached to brackets on each side of the cylinder block at the lower corners. Rear mounts are located between the lower rear edges of the clutch housing and short brackets cantilevered from the frame side members. Rubber insulation is used heavily — and is effective. When idling, the Chevrolet engine is noiseless and vibrationless and at 65 mph, the only vibration to enter the passenger compartment stems directly from road conditions. Glass area in the four door sedans totals a surprising 24.5 square feet — a lot of visibility for any car. Partial addition to this is the new wrap-around windshield which, in itself, increases windshield area 19 percent alone. Visibility across the flat hood is excellent, although the upward-sloped hood could Have been designed in reverse to allow more "close" visibility to the car. Inside the cockpit, the Chevrolet looks and feels "different." Ammeter and oil gauges have been dropped from the dashboard and replaced with red warning lights, like other competitive makes. The glove compartment has been moved to the dash center. Dash also includes a lighted quadrant for shifting the Powerglide at night. Shift mechanism on the steering post, long an eyesore in Chevrolet models, has finally been encased in one unit with the steering post. Pedals are hung in a style which was very successful for a competitor last year. The dash, itself, is a direct lift from Chevrolet's Corvette sports car but has had a wide band of chrome mesh added to it. An overhanging shelf protects the driver from chrome-glare but the painted dash shelf introduces reflections. The speedometer housing is V-shaped with a semi-circular top. 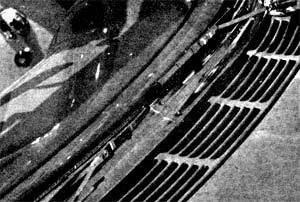 At the other end of the dash, another circle-topped V shape encloses the radio loudspeaker. Acoustically, this placement could be vastly improved. The test car was equipped with the GM push-bar tuning radio which automatically searches out the strongest signal when a button is depressed. Although ideal for keeping eyes on the road, the push-bar radio tuner, unless adjusted, has the annoying habit of stopping every fraction of an inch in highly congested areas with many radio stations, stopping not at all during the night out in the country where most signals are too weak. Instrument panel was lifted directly from the Corvette, but adds chrome mesh band. Powerglide quadrant is now at base of speedometer. Fresh air is introduced into the passenger compartment through an exterior cowl-wide intake, fashioned after Big Brother's. Provisions have been made to keep the incoming air dry and although the test crew did some of their stints during one of those summer showers, the incoming air stayed dry, did turn cool. This will solve the long standing problem of interior cooling during thunderstorms when an open window means soaked upholstery and a closed window means slow suffocation or steamy glass areas. Plenum chamber arching across the body at the cowl feeds air into passenger compartment. Provision is made to keep rain out. Seats are deep, soft and comfortable and upholstery fabrics, in the more expensive models, are top quality woolens, nylons and leatherettes in many shades and colors, all designed to complement the car's exterior paint job. Optional extra for the car this year includes electric windshield wipers for those who dislike waiting for a vacuum buildup. Electrical system is twelve volt, showing an industry-wide move toward the larger capacity system. Chevrolet for 1955, like so many of the more expensive cars, has also gone to tubeless tires. The MOTOR Life test staff found these tires completely satisfactory as compared with the conventional inner tube and tire. Although perfected to a point where they will probably never break the air seal, tubeless tires or too-low pressure seemed to be at fault for the only minor annoyances we found in the Chevrolet's handling, steering and cornering. Tubeless tires, in the main, are puncture and blow-out proof. With this guaranteed insurance, the American motorist can soon start leaving his spare tire at home. This procedure would not only add more luggage space to his car, but would decrease the car's weight by about 50 pounds — poundage which can make a difference in acceleration. Summed up, the Chevrolet for 1955 is a gathering together of the best mechanical and design features available in the industry today. It now has a V-8, ball-joint suspension, a big car look, and even paint treatments which resemble the big cars. To Americans who have always liked GM's psychology that the Chevrolet is just a small Olds, this year's model will go a long way toward carrying that belief toward full fruition. Whether Chevrolet's gamble on this close resemblance between its car and the Oldsmobile will help Chevy sales or harm Olds sales remains to be seen. The Chevrolet Bel Air or convertible with the "power package" plus its natural lines would seem to be a better buy for the same money than one of the older brothers in a sedan model, with more horsepower — but a lot more weight. With their primary target a dominant first in sales again — Chevrolet enters the new model year better-equipped for out-and-out comparison than it has ever been.